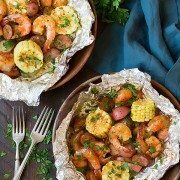 Looking for an easy dinner? 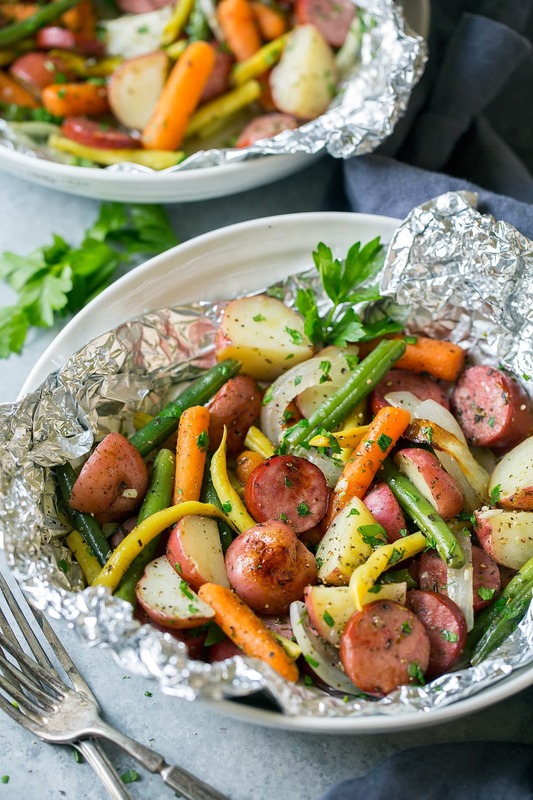 Look no further because these Garlic Herb Sausage and Veggie Foil Packs have got your busy weeknights covered! 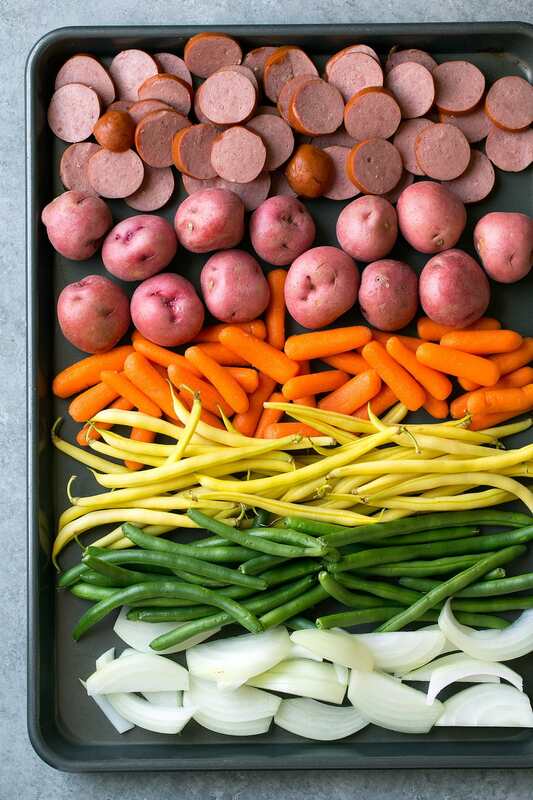 They’re packed with veggies and smoked sausage coins and they’re deliciously flavorful. 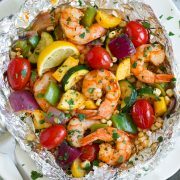 Foil Packs are the Perfect Easy Dinner Idea! While I’ve got foil packs on my mind I decided to try out another foil pack recipe. This time instead of doing shrimp like my last two foil packs (Garlic Lemon Butter Shrimp and Asparagus Foil Packs and Cilantro Lime Shrimp and Cauliflower Rice Foil Packs) I decided to go a turkey sausage route because we loved smoked turkey sausage. And then of course I threw in lots of colorful veggies and added in some of my favorite flavors. I love the way they turned out, they’re oh so perfectly delicious and so easy to make! Microwave potatoes to par-cook. Cut into quarters. Add potatoes, sausage, beans, carrots, onions and garlic to a large mixing bowl. Add in olive oil, Italian seasoning and season with a fair amount of salt and pepper to taste. Divide among 4 sheets of foil, wrap and seal ends. Lay on baking sheet and bake 35 – 40 minutes. Can I Cook These on the Grill? You could grill these as well, I haven’t tested yet but I’d go with a medium to medium-high heat and probably about 20 minutes. When making these, just be sure to seal your packs well when wrapping edges together and rolling the ends up, otherwise the liquids that should remain in the packet and will evaporate and things could burn. Also don’t wrap the packets too tightly, you want some extra space in there for heat to circulate so things cook evenly. Looking for an easy dinner? 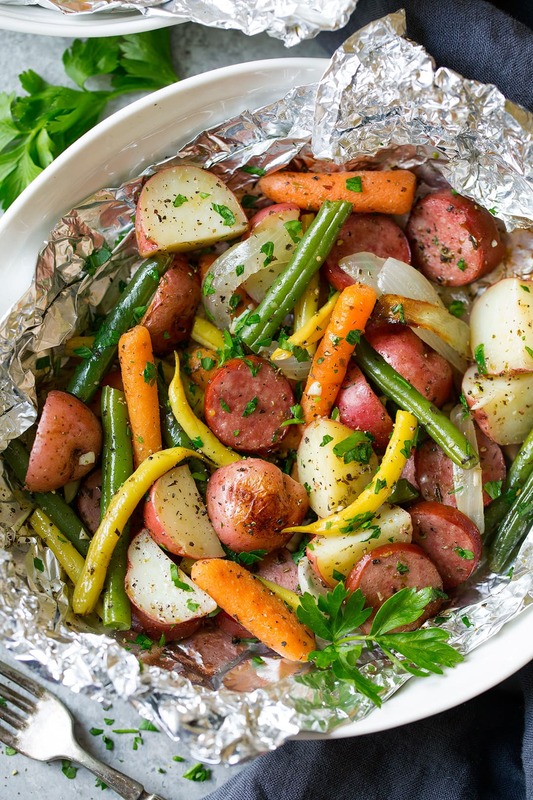 Look no further because these Garlic Herb Sausage and Veggie Foil Packs have got your busy weeknights covered! 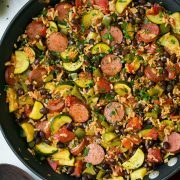 They're packed with veggies and smoked sausage and they're deliciously flavorful. Preheat oven to 400 degrees. Place red potatoes on a large plate and microwave for 3 minutes, turning once halfway through. Once cool enough to handle cut into quarters. 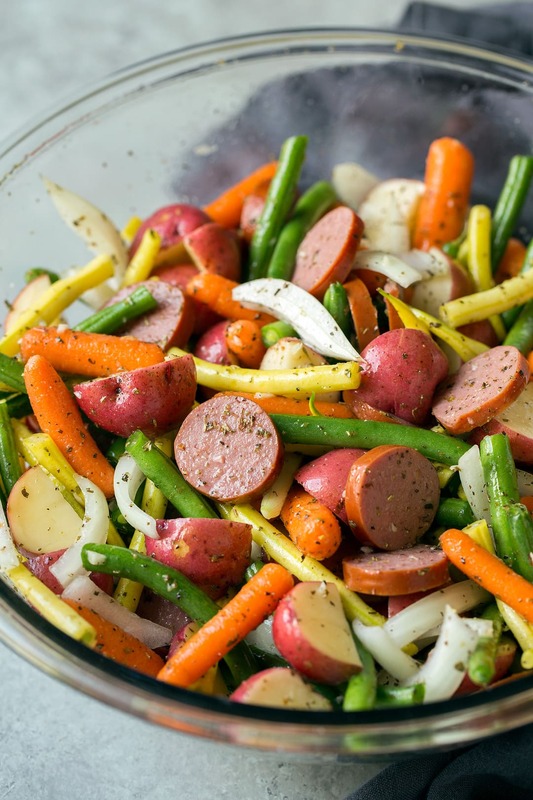 Add potatoes, sausage, beans, carrots, onions and garlic to a large mixing bowl. Add in olive oil, Italian seasoning and season with a fair amount of salt and pepper to taste. Cut 4 pieces of 16 by 12-inch heavy duty aluminum foil. Lay each piece separately on a flat surface. 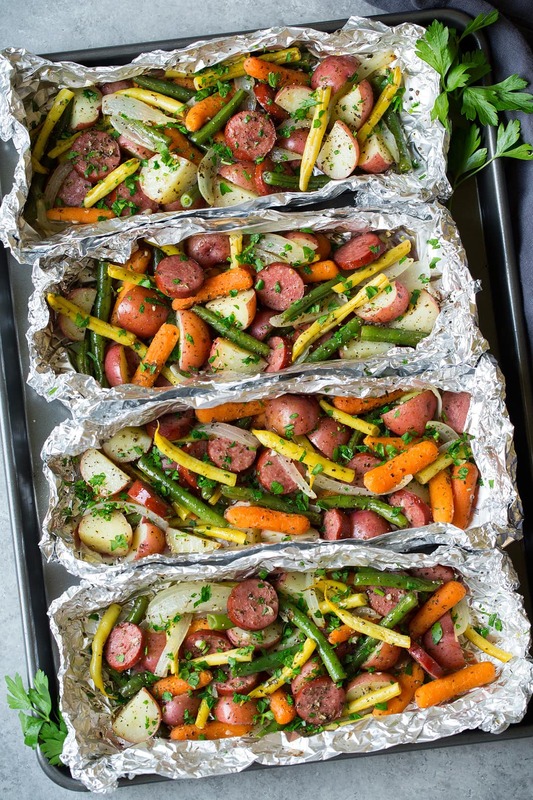 Divide sausage mixture evenly among sheets of foil, creating a somewhat rectangular shape with the mixture. Wrap sides of foil in then fold 2 times to seal while leaving room for heat to circulate, then wrap ends up folding twice to seal. Lay foil packs side by side on a 18 by 13-inch baking sheet. Bake in preheated oven until veggies are tender, about 35 - 40 minutes. Carefully open packets (they'll steam!). Sprinkle with parmesan and parsley. Serve warm.